In 2012, IZA launched a series of five open-access online journals in cooperation with SpringerOpen to provide a high-quality, peer-reviewed outlet characterized by a fast decision-making and publication process. By now, the IZA Journals have become well-established in the scientific community. All five journals are listed in the Scopus series. 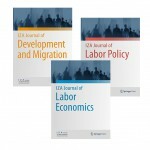 The Australian ABDC index ranks the IZA Journal of Labor Economics as an A journal. Two journals are being evaluated for inclusion in the Thompson Reuters index. These successes notwithstanding, it is time to look at potential improvements, both in terms of quality and in terms of costs, which have so far been covered fully by IZA. Based on valuable feedback from the members of the IZA research network, it was decided to merge journals with a similar focus and continue with three instead of five journals. All previously published and forthcoming articles will be accounted for within the newly merged journals, thus ensuring that the authors’ investments are preserved. As of April 1, 2017, the IZA Journal of Labor Policy and the IZA Journal of European Labor Studies will be merged into the IZA Journal of Labor Policy. The new JoLP is strategically positioning itself more explicitly towards policy relevance. The other merger will affect the IZA Journal of Labor & Development and the IZA Journal of Migration, which will become the IZA Journal of Development and Migration. Its focus will be on labor and migration in the context of economic development and vice versa. The IZA Journal of Labor Economics will remain as is.